1. Simple Embroidery stitches in bright, fun colours dress up a blah sweatshirt with fashionable style. 2. Zip & Contrast Sleeves give this shirt a fashion edge by sewing a zipper into the raglan seam and adding contrast tshirt sleeve bottoms. 3. Spray Paint Skyline is so easy - fabric paint spray, a cardboard cutout of a city skyline, spray and voila, a bright skyline. 4. Gathered Shoulders restyle this oversized sweatshirt into something special. 5. Uptown Sweats by breaking up a necklace, spray painting the beads and sewing on in allover pattern. 6. Fuzzy Felt Elbows using felt or felting with a heart cookie cutter. 7. Lacy 'n Feminine and sheer by attaching lace fronts to a hoodie. 8. Knitted Up Front and attaching the knitted piece to the cut out front of a sweatshirt. Thank you for the overwhelming popularity of the original post - No Sweat - Sweatshirt Makeovers - it inspired me to post No Sweat 2. Hopefully the ideas in this post will be just as inspiring. Enjoy! Hi ! just found your blog and absolutely love it! 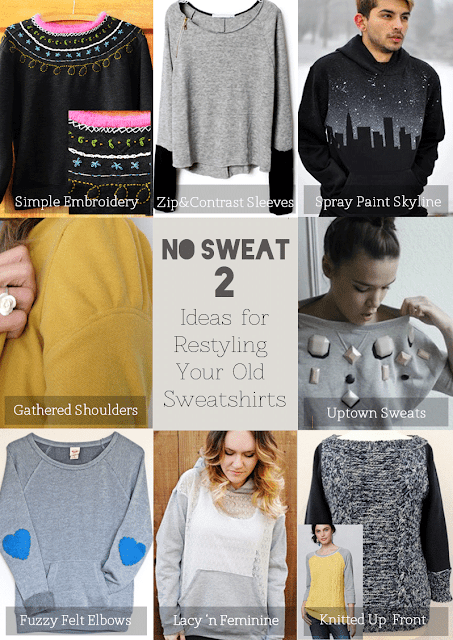 thank you for including my sweatshirt refashion in this great round-up! Thank you so much...very kind of you. I'm also inspired by your blog. You have very interesting projects.